The province of Teramo has some of the oldest and most beautiful Benedictine Abbeys in Abruzzo, located in the quiet, verdant foothills of the Vomano and Mavone valleys, each with their own enchanting view. The historic role and influence of these Abbeys (Valle delle Abbazie) on the economic development of Teramo cannot be overstated; without them the countryside would look very different, its dishes and wines less important, its people with fewer tools to hand and less community spirit when facing a struggle. Four years ago five of these masterpieces of architecture & design became host to a series of intimate classical musical concerts for up to thirty people, organised by the Luzmek collective. The ten concerts held in 2018 were a part of the European Year of Cultural Heritage and its remit to identify the common roots and connected history that threads together to define the European identity. The Luzmek musical director & maestro Carlo Michini creates immersive musical experiences that aurally encourage the audience to discover how St Benedict softened the Europe of the Middle Ages through cultivation, arts and study that would go on to become the foundations that helped oppose rivalry, struggle and oppression. At each concert there is an opportunity to enjoy a guided historical tour of the abbey and taste superb local 0 km produce from the surrounding farms and producers. We have two pairs of tickets to give away to two of these enchanting evenings, where you can listen to great music in incredible locations as well as enjoy a tour of the abbey and sample fantastic locally-produced foods and wine. To enter simply ‘Like’ this post on Facebook or Instagram and tell us which date you would prefer to attend. We will pick the winners on Thursday 30th August at noon and contact the winners via a direct mail. Enjoy a night at the 12th century Abbey, Santa Maria di Ronzano that is Romanesque Pugliese in style and considered one of Abruzzo’s true jewels with the oldest mosaic fresco painting cycle. It is surrounded by greenery and has awe inspiring views of the Corno Grande and Gran Sasso. Music for the evening will be performed by piano prodigy Alessio Cioni, a daredevil concert of virtuosity and infinite melodic openings from the works of Beethoven, Schubert and Liszt that move between dream and reality, a monumental concert where nothing is impossible. 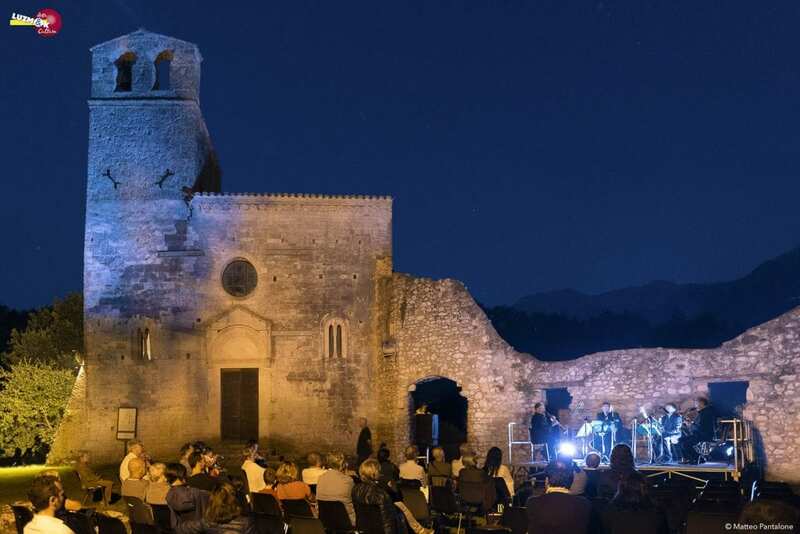 A stunning musical evening hosted in the 13th century Abbey of Santa Maria di Propezzano that preserves, in addition to the church, the ancient Benedictine cloister and part of the convent that today is home to the “Abbazia di Propezzano” winery. This cultural mix of music, art and flavours begins with a tour of the abbey followed by an aperitivo at the local olive mill, Oleifico Montecchia to sample the incredible indigenous olive oil. Maria Rosaria D’Aprile and Tommaso Coagto will give a startling sensory performance that dips between Romanticism, Impressionism and Art Noveau.